The hardest part about losing weight is to stay motivated. Usually the results are very slow to notice, so day by day you stop seeing the point in going on. This is when turning to people for help is a great idea. It is always more fun to try to achieve your goals together with someone. Both the feeling of being supported and the contest spirit keep you encouraged and motivated. SparkPeople promotes “a new approach to weight loss” which is basically nothing new but sounds useful: join support groups and help each other lose weight. Then you choose friends and/or family members to become your ‘traineo motivators’ who will track your progress. This is actually a unique and useful feature: your “motivators” will be receiving your Traineo reports and (if they notice that you seem to be giving up) they can quickly get you motivated again. traineo in under 2 mins from traineo on Vimeo. 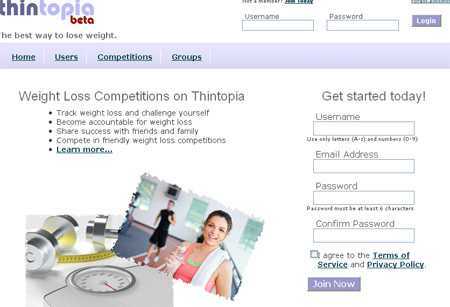 Thintopia invites you to lose weight collaboratively by taking part in weight loss competitions. It lets you meet other like-minded people and connect with them. While the site is really limited in features and simple in design, it does have a great idea. By competing each other you can achieve a lot and have fun as well! The guest post is by Eric who has recently started a website on treadmills for sale.